One of the defining characteristics of our establishment is the near complete absence of soft, squishy things. We call it The Ridgid Environment and our students have learned to embrace it as one of the most important teachers they’ll ever have. 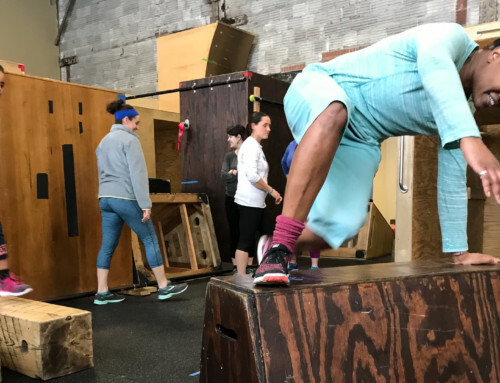 The world that surrounds us is not soft or squishy and we see the over prevalence of soft surfaces at playgrounds and gyms as something that fosters poor movement habits and unhealthy technique. With that said, there’s still definitely a lot that can be learned from trampolines or spring floors when used the right way. 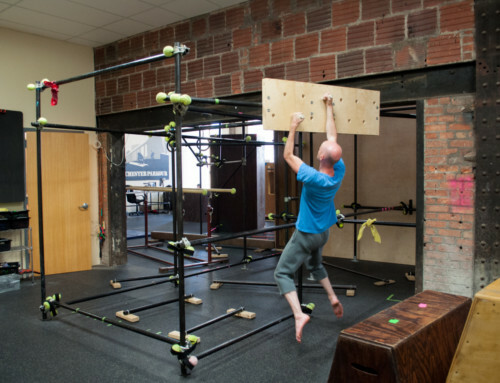 We’ve been debating this addition for quite some time, but the real push came when our beloved instructor Devin Strehle accepted his new job in Denver, CO.
Before leaving, Devin left a sizable donation to the gym specifically for this purpose. As a thanks, and so as to ensure that his love for flips, tricks, and acrobatic maneuvers could continue, we’ve named the mat in his honor. If you’ve never heard of an AirTrick or have never used one, we’d like to first explain what it is not. 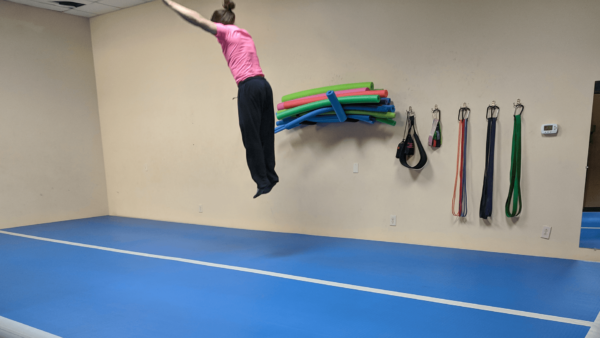 Instead, the AirTrick is a training tool that is something inbetween a normal gymnastics spring floor and a small (read: not super bouncy) trampoline. The mat itself is 13 feet wide by 26 feet long and its rebounding capabilities will greatly enhance the acrobatic desires of our students. 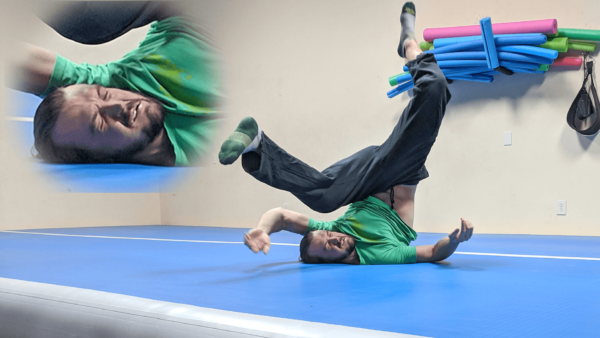 Tumbling can now be trained more easily and more safely with the use of this mat and the concept of bailing on a flip, while still not desirable, will be a lot easier to allow. As the name suggests, this mat is inflatable – it can be inflated in about 20 minutes and it can also be deflated in roughly 5 minutes and folded up to take up no more than 20sqft. That means that for us and our small foot print of a gym, the mat will not always be inflated so that we can still utilize the square footage of the cubby when we need it. Participants are limited to practicing or training skills and techniques that they’ve been taught by an instructor. Just because this mat can be used for acrobatics, doesn’t mean you should try any acrobatics without the proper knowledge or instruction. *Priority for the AirTrick will always be given to the Acro Class on Mondays from 8pm – 9pm, but there may be days that the class will not be utilizing the mat. **The schedule as stated is preliminary and subject to change. 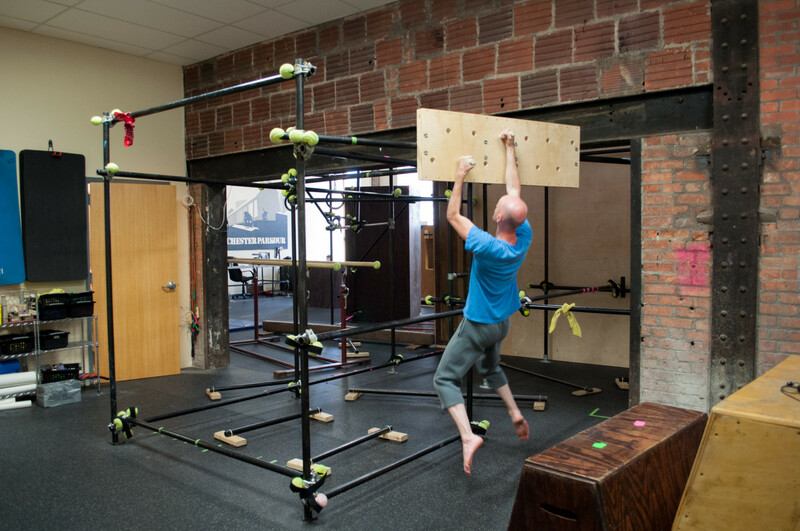 We welcome any and all feedback to ensure that the gym space works for you, whether that includes the new AirTrick or does not. Currently, the only plans we have for the actual use of the mat will be for Mixed Open Gym times. This is, in part, due to the fact that we do not further restrict the clothing and apparel choices of our students past the indoor shoe requirement. 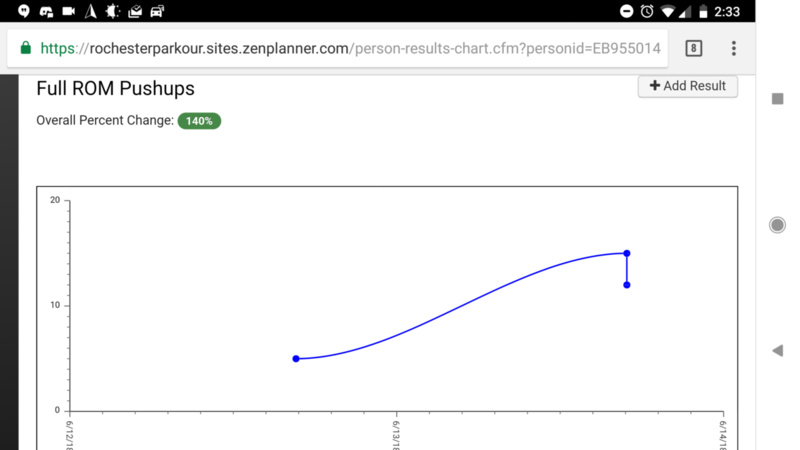 This means our instructors cannot plan an entire class’ curriculum around the AirTrick, given the possible scenario of one of our students showing up in jeans (or other restricted apparel item), without a change of clothing, that would result in their non-participation. 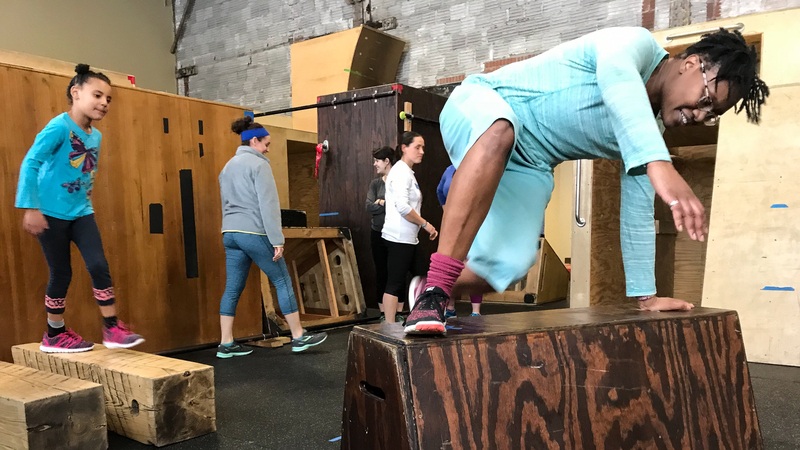 While not guaranteed, use of the AirTrick for warmups, technique training, or other various drills could be made of use by our instructors should the entire class of students satisfy the apparel restrictions. 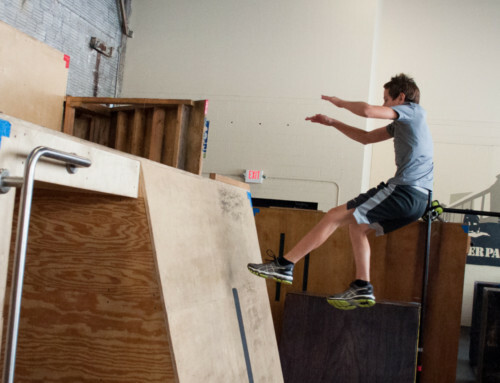 The AirTrick is an excellent way to play around with techniques and tricks that would otherwise be a challenge to learn due to the possibility of bails – things like handstands, dive rolls, flips, handsprings, kip ups, or other dynamic techniques that could result in a hard impact on the floor. Obviously, most of these endeavours might seem either too challenging for you and where you are on your movement journey right now or may not be something that interests you. 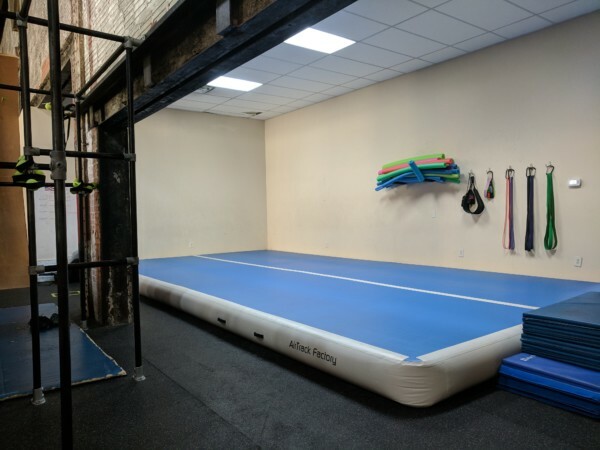 At the same time, this mat can also just serve as a great way to build lower body strength and power by simply jumping on it for a set period of time, practicing broad jumps without all the impact the floor provides, practicing dynamic QM techniques like monkey jumps or ground kongs, or any other simple bouncing drills. 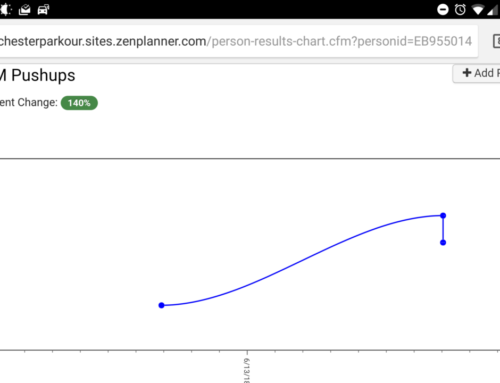 Instructor Charles will be using the RocPK Instagram and our ZenPlanner Workouts site to create a database of helpful drills and exercises that can be done on the mat suitable for all skill levels. Those videos should be coming out later this week. We’re excited to be including this item into our new “Bag o’ Tricks” (pun intended) and we’re excited to see you all use it to enhance your training. 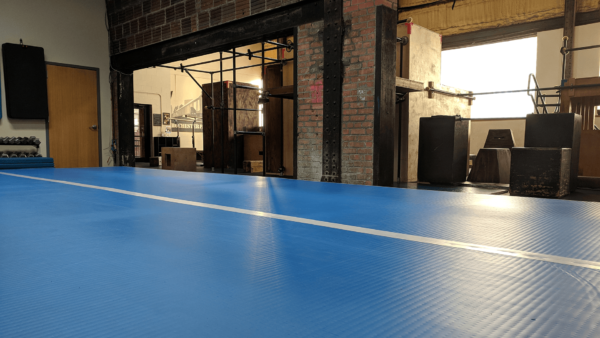 Let us know if you have any questions or comments regarding the mat, its use, or anything else. 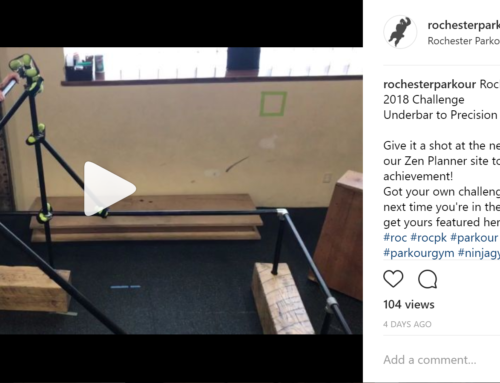 By charles|2018-11-21T23:32:14+00:00October 22nd, 2018|News|Comments Off on Introducing: The Strehle AirTrick!